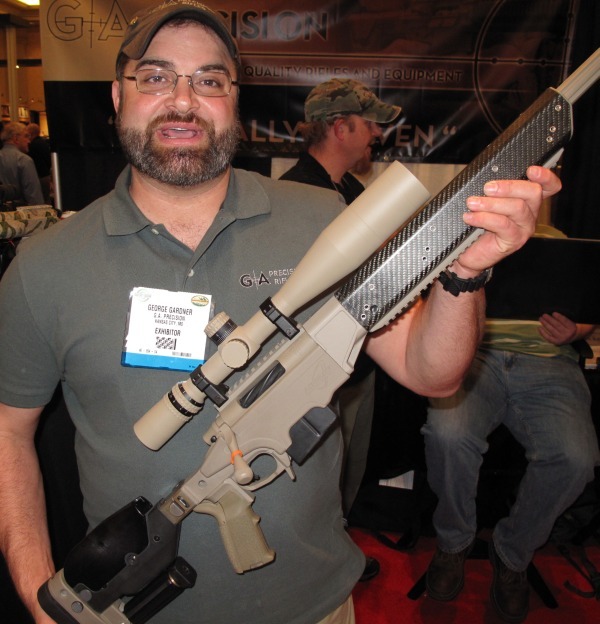 For the past few years, tactical rifles have been a hot item at SHOT Show. While in the past ARs and AR variants grabbed the headlines, this year, tactical bolt-guns enjoyed the spotlight, with many manufacturers showcasing new tactical rigs built on modular stocks. The user-configurable chassis systems on these rifles provide myriad mounting options for scopes and accessories. Here are new offerings from Surgeon Rifles, G.A. Precision, and Remington. At the Surgeon Rifles booth, Preston Pritchett (Surgeon’s owner), displayed an impressive rifle built on the all-new Accuracy International AX folding-stock chassis. The AX is completely different than previous AI chassis designs. Preston told us that only 11 of these AI AX modular stocks have been manufactured so far, and he received this example just two days before SHOT show. He immediately installed a Surgeon action and barrel — but the display rifle has not even been shot — that’s how new this design is. The AX chassis features an adjustable folding stock, and a forearm slotted for rails on all SIX sides. There is a nice over-molded, polymer gripping piece forward of the magwell. The pistol grip is nicely designed — comfortable to hold. The hexagonal AX forearm, with slots for rail-attachment, is slimmer than the handguards found on some other “black rifles” which have multiple, heavy full-length rails permanently attached to the fore-arm. Having non-removable full-length rails really is overkill. The AI AX chassis lets you mount accessory rails on six surfaces if you really need that capacity. But otherwise, you can leave the rails off. We like that flexibility. When not in use, rails are just extra weight. These new-generation tactical rifles are heavy enough as it is. So when can you get one, and how much will it cost? Preston expects to have chassis units ready for builds in “about two and a half months”. The AI AX chassis system will cost $1299.00 by itself. For a complete AX-equipped Surgeon custom rifle, in addition to the chassis cost, add the price of a Surgeon action ($1295.00 MSRP), a custom barrel, and chambering. That’ll put you close to $3200.00, depending on barrel and action choice. If you want to buy a turn-key factory rifle using the new AX chassis, Accuracy Int’l now produces the AX338, shown below. This features an Accuracy Int’l action fitted in the new AX chassis. Right now the AI-built gun is available ONLY in .338 Lapua Magnum. 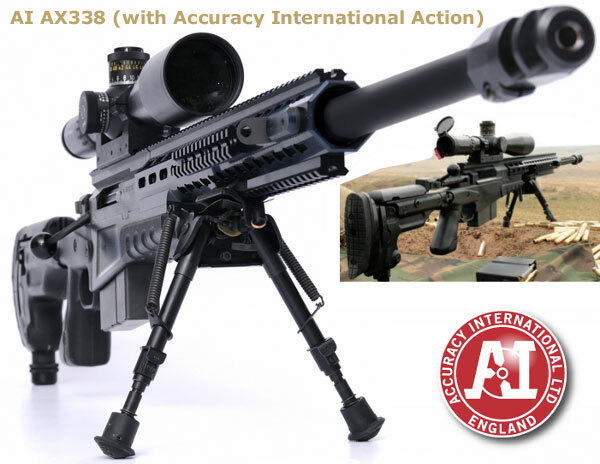 AI’s complete AX338, produced in the UK, will cost thousands more than a rifle built by Surgeon on the AX chassis. Our friend George Gardner of G.A. Precision (G.A.P.) 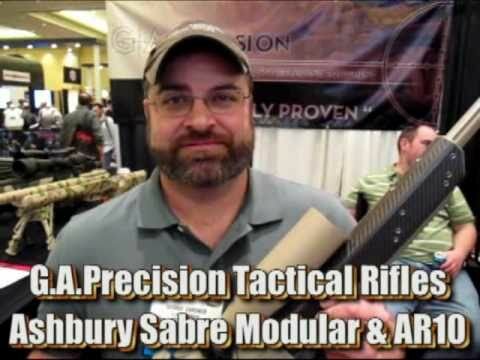 showed off his latest and greatest rifle for tac comps. The gun features a G.A.P. Templar action in the new Ashbury Int’l Sabre Chassis. The Sabre chassis has lots of trick parts to reduce overall weight. For example, the handguard is made from super-light carbon fiber. The central chassis (holding the action), is made from aluminum and there are many ultra-light titanium components. GAP’s prototype rifle was chambered in .260 Rem, but other chamberings, including .308 Win, will be offered in the future. We were impressed with the Ashbury Int’l design — some smart thinking went into weight reduction. 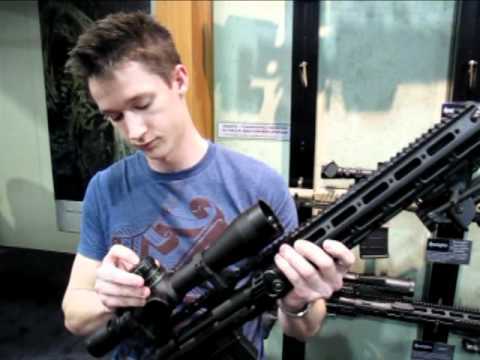 It is not brutally heavy like some other metal-stocked tactical rifles. We like that fact that the Sabre comes in two versions, the simple “Mod 0″ with minimal rails, and the “Mod 1″ for those guys who need to attach a full set of accessories. George also showed us one of G.A.P.’s semi-automatic AR10s. These have shown outstanding accuracy, frequently delivering 1/2-MOA or smaller three-shot groups with premium factory ammo. 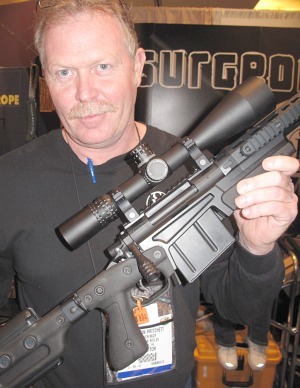 While George still recommends that novice tactical shooters employ a bolt-gun, he remarked that a semi-auto can be very effective in timed, “target-rich” tactical matches. 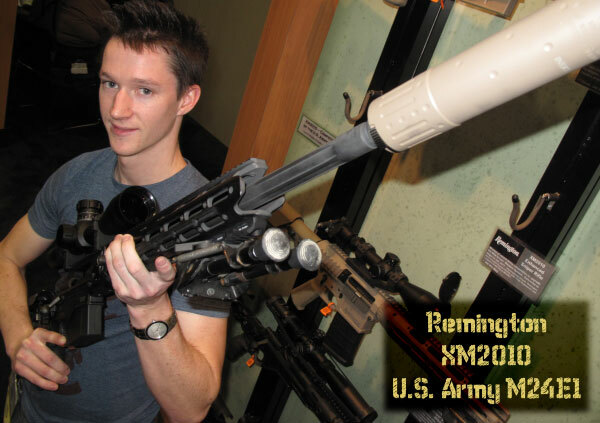 Remington displayed its new XM2010 — the winner of the contract to replace the U.S. Army’s M24 Sniper Rifle. The gun, designated the M24E1, offers all the features the Army wanted… but it is a beast. The Army’s new M24E1 sniper rifle will share the Rem 700 long action (receiver) and trigger from the currently-fielded M24, but little else. (The Army specifically required that the M24E1 be built around the same 700 series long action and fire control system.) The M24E1 is considered a “total conversion upgrade”, by which the barrel, stock, magazines, muzzlebrake, suppressor, and even the optics will be changed. The M24E1 will carry a 6.5-20×50 variable power Leupold scope with a first focal plane (FFP) reticle that includes .300 Win Magnum bullet-drop compensation markings. 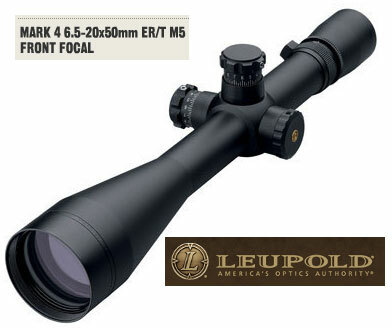 A key component of the M24E1 system is the new 6.5-20x50mm Leupold Mark 4 Extended Range/Tactical (ER/T) M5 riflescope (34mm locking version). This scope features First Focal Plane (FFP) Horus ranging reticles (H27 or H58), side parallax adjustment, and a beefy 34mm maintube. Other notable features of the new ER/T include M5 windage and elevation adjustment dials with audible, tactile 1/10 (0.1) milrad clicks to match the mil-based Horus reticles. An elevation zero-stop helps prevent under-rotation in high-stress situations. The eyepiece offers long eye relief and it employs a “lockable” fast-focus design to ensure that the reticle remains in sharp focus. The scope has an auto-locking elevation adjustment. At SHOT Show, Remington also showcased its new Modular Sniper Rifle (MSR), Remington’s entry into the competition for the new SOCOM Precision Sniper Rifle (PSR). Remington’s MSR competes directly with Barrett’s new MRAD, profiled earlier this week in the Daily Bulletin. The MSR features a beefy new titanium receiver with the ability to handle multiple chamberings up to .338 Lapua Magnum. The MSR was designed from the ground up as a switch-barrel rig, with a floating handguard, and folding, adjustable buttstock. The whole system is modular. By exchanging bolt-face, barrel, and magazine, the gun can switch from .308 Win (7.62×51), to 300 Win Mag, to .338 Norma Mag, and to .338 Lapua Mag. 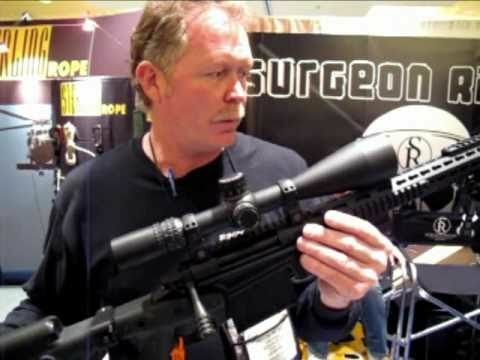 Share the post "SHOT Show Report: New Tactical Rigs from Surgeon Rifles, G.A. Precision, and Remington"